Cidade de Goa is located on Vainguinim Beach between a green hill and the deep blue sea – the sort of setting that can turn even the most ordinary person romantic. The resort built on 40 acres of lush greenery, was created to resemble a self-contained Portuguese hill hamlet (the resort's unique architectural grandeur, earned an international R.I.B.A. award). As you step in to the Lobby, you are greeted with a spectacular view of the Arabian Sea unmatched in Goa. The bright murals and the statues of Vasco da Gama in his three facets as an Adventurer, Statesman and Philosopher, along with the fountains further enrich the character & the ambience. Alfama :- Famous for its ambience, this serves the best of Portuguese cuisine. Doçaria :- The coffee shop at the hotel. Grande Sala :- perfect for meetings arranged for around 500 people. Home to some of the most picturesque beaches in the world, Goa is truly one of the most favorite holiday destinations in the world. 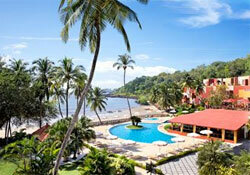 The capital of the province, Panjim too is a city, which reveals many of its exotic secrets during a tour to Goa.